BA Waste & Recycling - Garden Services, Rubbish/Waste/Clearance based in West Wittering, West Sussex. 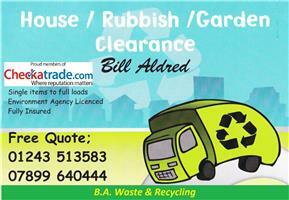 With more than 20 years experience in waste clearance and recycling, I started B.A Waste & Recycling in 2014. We provide a professional, friendly service. We do ALL the lifting and loading, taking pride in all aspects of our work. We are fully Environment Agency licensed and insured. Electrical appliances - Fridge Freezers, Washing Machines, PCs, T.Vs etc. We separate and donate any reusable items to various charities. Remaining waste is then taken to the appropriate licensed recycling plant.